﻿ Does Gestational Diabetes always mean a Big Baby & Induction? This question was submitted to me by one of my readers, Sarah. Evidence Based Birth® offers an online course on Big Babies and Gestational Diabetes (3 contact hours)! To learn more, click here! Dr. Shannon brings up several good points. First, she is talking about “routine care,” which is very different from “evidence-based care.” Routine care means that this is what everyone is doing—it’s routine, it’s standard. Evidence-based maternity care means offering care that is based on the latest, highest-quality evidence while also taking into account an individual woman’s values. Interestingly, when Obstetricians say that they are following “routine care,” sometimes that routine care is not recommended by ACOG (the American Congress of Obstetricians and Gynecologists). Upon reading the ACOG guidelines for gestational diabetes, I found no recommendation regarding labor induction for women with gestational diabetes. Although interestingly, ACOG guidelines do recommend that elective Cesarean section should be offered to women with gestational diabetes if it is suspected that the baby is 4,500 grams (10 lbs) or higher. The authors of the ACOG guidelines state that this particular recommendation for C-section is based on limited or inconsistent scientific evidence, but upon reading the entire ACOG article multiple times, I could not find any evidence to support this recommendation other than clinical opinion. But, I digress. Dr. Shannon raised a second important issue when she mentioned that many providers scare women into inductions by talking about stillbirth. In fact, one of my readers recently shared with me her personal story about how an OB resident frightened her with talk of gestational diabetes and “fetal mortality.” However, there is no evidence to support the claim that gestational diabetes is associated with stillbirth or newborn death. When I wrote my first article about gestational diabetes and the glucola test, I talked about the HAPO study. The HAPO (Hyperglycemia and Adverse Pregnancy Outcomes) study was the largest and highest quality study so far on gestational diabetes and outcomes. (You can read the free article here). In the HAPO study, researchers followed more than 25,000 women throughout their pregnancies. The researchers found that with higher blood glucose levels there is a higher risk of baby being born large for gestational age, C-section, pre-eclampsia, shoulder dystocia (difficulty birthing the shoulders), birth injury, neonatal intensive care, newborn jaundice, and premature delivery. Even with 25,000 women, stillbirth or newborn death is such an incredibly rare event that this particular study did not have a big enough sample to look at deaths. However, the authors reported that there were a total of 130 fetal or newborn deaths (these deaths happened to infants of women with and without gestational diabetes), and that there was no association between stillbirth or infant deaths and gestational diabetes (Metzger, Lowe et al. 2008). Are there effective treatments for gestational diabetes that reduce the risk of poor outcomes? Does induction improve outcomes in women with gestational diabetes? Let’s look at question 1 first—can a woman with gestational diabetes reduce her risk of having a big baby? I started out my detective hunt on PubMed by looking first for meta-analyses of randomized, controlled trials. This is considered the highest level of scientific evidence. 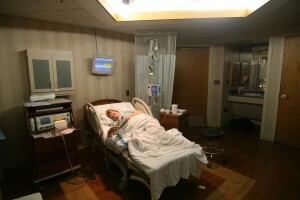 Does gestational diabetes automatically mean an induction for big baby? There were no differences between groups in the risk of C-section, pre-natal hospitalization, vacuum or forceps delivery, postpartum hemorrhage, length of hospital stay, gestational age at delivery, bone fractures, nerve palsy, infant death, infant hypoglycemia, or need for resuscitation. So what do these results mean? How can we answer Sarah’s question about gestational diabetes and big babies? Well in a way the results are kind of empowering. If you are diagnosed with gestational diabetes and you receive any treatment at all (such as dietary advice or medication), you are less likely to have a baby that weighs more than 8 lbs 13 oz or pre-eclampsia. You are also less likely to experience one of the following: shoulder dystocia, infant death, bone fracture, or nerve palsy. Unfortunately, the benefits of treatment for gestational diabetes come at the price of an increase in the risk of induction. What is still unknown about treatments for gestational diabetes? Well, we don’t know the long-term effects of treatment. We don’t know which treatment is best—dietary advice, medication, monitoring, exercise, or a combination of the above. We don’t know if oral medications are better than insulin, although evidence suggests that oral medications may be more effective than insulin at reducing the risk of C-section and infant hypoglycemia. We also don’t know—based on this Cochrane review—the psychological impact of treatment on women. However, the ACHOIS researchers did find that women who received treatment had lower levels of postpartum depression. Unfortunately, the results of this Cochrane review—although empowering—also highlight the current confusion about the best way to treat gestational diabetes. So what about Sarah’s second question? Does gestational diabetes always mean induction? Boulvain et al. (2009) did a Cochrane review in which they searched for randomized, controlled trials that compared elective early induction versus letting labor begin on its own in women with gestational diabetes. Unfortunately, they found only one randomized, controlled trial (Kjos et al., 1993). In this one study, researchers randomized 200 women (all of whom required insulin for their gestational diabetes) to elective induction at 38 weeks or watchful waiting until 42 weeks. The quality of this study was questionable—there was cross-over between groups (half of the women in the watchful waiting group were induced). Also, the researchers did not report how they randomized the women. Both of these problems can increase the risk of bias. So you have to take those problems into account when reading the results. The researchers found that there were no differences in C-section rates between the 2 groups. The induction group was less likely to have large babies (> 8 lbs 12 oz or 4,000 g), which is not surprising given that these births were electively induced 2 weeks early. There were 3 cases of “mild” shoulder dystocia in the watchful waiting group, but all of these cases were resolved without problem. So what do these results mean? The results of this Cochrane review do not support the theory that early induction improves outcomes in women with gestational diabetes. Why not? Well, for several reasons. First, a single randomized, controlled trial (with bias problems) is not the highest level of evidence. Ideally we would have multiple, high-quality, randomized, controlled trials on this issue. Second, this study only included women who were dependent on insulin for their gestational diabetes. Women who can manage their diabetes with dietary changes or oral medications are a very different population. You cannot draw conclusions from one group of women (who require insulin) and put those same conclusions on a second, completely different group of women (diet-controlled) when there have been no studies in the second group! Third, the researchers of this single study did not measure several important outcomes—including vacuum or forceps delivery, women’s views of their care, infant admission to the neonatal care unit, and complications related to premature delivery. Fourth, the sample size was too small to estimate the effects on other important outcomes, such as infant birth injury or death. In summary, based on this Cochrane review there is not enough evidence to recommend routinely inducing labor for all women with gestational diabetes. This conclusion is supported by a recent systematic review about inductions, in which researchers found that there is not enough evidence to support the routine induction of women with gestational diabetes (Mozurkewich et al., 2009). These are interesting conclusions, given that the FDA lists gestational diabetes as a medical indication for labor induction with Pitocin. Fortunately, researchers are currently conducting a large randomized controlled trial to compare induction versus watchful waiting in 1,760 women (Maso et al., 2011), which should help shed some light on this issue. So Sarah, back to your question. Does gestational diabetes automatically mean a big baby? Does it automatically mean induction? The evidence-based answer is “no.” Receiving a diagnosis of gestational diabetes does not automatically mean big baby, and it does not automatically mean induction. Do you know someone who has been diagnosed with gestational diabetes? Did their healthcare provider recommend an induction? Did you like this article? Want to learn more? Follow Evidence Based Birth® on Facebook, Twitter, or Pinterest! And subscribe to the FREE newsletter here! (2001). “ACOG Practice Bulletin. Clinical management guidelines for obstetrician-gynecologists. Number 30, September 2001 (replaces Technical Bulletin Number 200, December 1994). Gestational diabetes.” Obstetrics and gynecology 98(3): 525-538. Alwan, N., D. J. Tuffnell, et al. (2009). “Treatments for gestational diabetes.” Cochrane database of systematic reviews(3): CD003395. Boulvain, M., C. Stan, et al. (2001). “Elective delivery in diabetic pregnant women.” Cochrane database of systematic reviews(2): CD001997. Crowther, C. A., J. E. Hiller, et al. (2005). “Effect of treatment of gestational diabetes mellitus on pregnancy outcomes.” N Engl J Med 352(24): 2477-2486. Kjos, S. L., O. A. Henry, et al. (1993). “Insulin-requiring diabetes in pregnancy: a randomized trial of active induction of labor and expectant management.” Am J Obstet Gynecol 169(3): 611-615. Maso, G., S. Alberico, et al. (2011). “”GINEXMAL RCT: Induction of labour versus expectant management in gestational diabetes pregnancies”.” BMC pregnancy and childbirth 11: 31. Metzger, B. E., L. P. Lowe, et al. (2008). “Hyperglycemia and adverse pregnancy outcomes.” N Engl J Med 358(19): 1991-2002. Mozurkewich, E., J. Chilimigras, et al. (2009). “Indications for induction of labour: a best-evidence review.” BJOG : an international journal of obstetrics and gynaecology 116(5): 626-636.